Memorable, dynamic and engaging, Debra Jason empowers your audience with business-building success strategies. They leave energized, enthusiastic and wanting more. Do You Want To Inspire and Engage Your Audience? Want Them to Leave Not Only Feeling Energized, But Empowered? 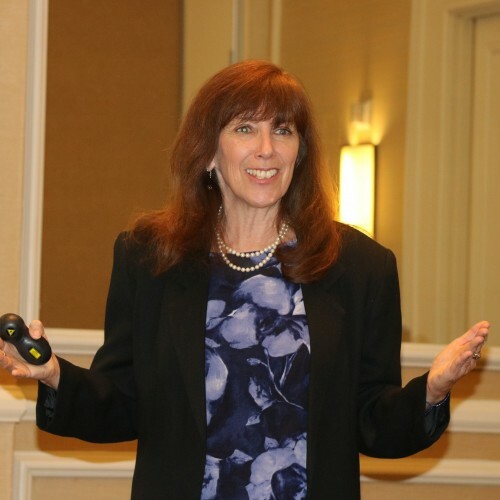 Whether your audience is 12 or 1,200 in North America or abroad, Debra can deliver a customized message of motivation for your meeting, conference or company workshop. She understands that your audience members want not only to be inspired, but to receive real-life, innovative business-building strategies that they can implement right away. Debra is the award-winning author of Millionaire Marketing on a Shoestring BudgetTM. An entrepreneurial spirit, she started her own business in 1989. Attracting a steady stream of happy clients. Nurturing relationships in a digital world. Generating leads that convert prospects into loyal, raving fans. Creating captivating messages that resonate with prospects. Maximizing and getting value from their experience on LinkedIn. Debra helps enthusiastic business and sales professionals – who want to increase their visibility – fast forward their marketing, without breaking the bank, so they not only nurture profitable relationships, build their personal brands, and grow their businesses, but they create a lifestyle that provides them with the freedom, flexibility and fun to do what they love. Her presentations incorporate her honesty, integrity and heartwarming style, which participants have described as inspirational, engaging, energetic and educational. Debra’s speaking philosophy is to entertain you and your audience members with passion, optimism and real-life examples that inspire them along the road to success. From entrepreneurs and independent business professionals to sales teams and marketing professionals, your audience walks away feeling confident, encouraged and empowered. Words of Praise for Debra's Speaking. . .
"Debra energized me with great ideas.” ~ P. Dumas, HBP Inc., Washington, D.C.
Are you seeking greater exposure for your business? Want to achieve top-of-mind awareness in the marketplace? Frustrated because you think you have to spend a lot of money to get noticed? If you answered “yes” to one or all of these questions then this book was written for you. It’s frightening to dip into your budget and keep on spending when business is slow, isn’t it? However, to stay ahead of your competition, marketing should be an ongoing priority for your company. The good news is you don’t need a Super Bowl budget to attract new customers. You can market yourself — and your business – in more ways than one without breaking the bank. Throughout the pages of "Millionaire Marketing on a Shoestring Budget™," I share practical yet creative ideas on how to successfully get your message out into the world. It’s a compilation of strategies that I implemented during my 29+ years in business – and, I’m still here today, so I am happy to help you discover how to enjoy longevity in your business as well. Creative Person of the Year - 2004 - Rocky Mountain Direct Marketing Association (RMDMA). Recognized by my peers in the direct marketing industry for my skills as a direct response copywriter. Small Business of the Year -1998 - Boulder Chamber of Commerce. For outstanding accomplishment as a single-person business, known as the "Lone Eagle" category. Volunteer of the Year - 1993 - Boulder Chamber of Commerce. Served as an ambassador for the Boulder Chamber of Commerce, chaired the the Small Business Council, presented numerous marketing programs, co-founded the Businesswomen's Leadership Group and served on the Board of Directors. Find out more about Debra Jason at https://DebraJason.com.